Back then, I always stamped my signature stamp into my planted boxes--a practice I've largely stopped doing mostly out of laziness than any real reason. And this logbook is the only logbook I know of, still in the wild, that had my original signature stamp in it. I only used this signature stamp in maybe two or three dozen boxes--I soon replaced it with a purple spider stamp because I quickly realized that the signature stamp was much too large for many logbooks! I used this signature stamp for about a month before retiring it. And that was ten years ago--the logbooks I stamped it into have either gone missing or the logbooks damaged by water. I based it on a photo I took of Mount Hood, near where I lived at the time, and carved my initials into the stamp to really "make it mine." 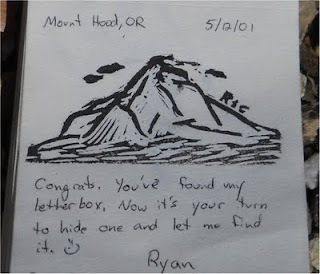 I didn't have a trailname back then, I was just Ryan. I'm also amused that I ordered people to plant their own letterbox and let me find it. =) Back when I planted this series, there were 30-some letterboxes in the entire state of California, and none in San Luis Obispo County where I planted the series. Getting others to plant boxes was important! I look back at the stamps today and shake my head. So primitive. So simple. I still like them, though. Of the four boxes I originally planted that fateful day, only that worm has survived the whole ten years. The oak tree went missing almost immediately, and I've carved a couple of replacements since. The butterfly lasted a couple of years, but it too met its demise and was replaced on a couple of occasions. The spiderweb survived for most of the decade, which was all the more surprising because it was found on a regular basis by muggles who'd sign in about how exciting it was to find the box by accident. They kept the logbook and stamp there for years. The last few years, however, have not been kind to that box. Seems that potheads found it and stopped leaving it in such a pristine condition. The box lingered on, but the logbook faced water damage when the ZipLocks failed. I replaced the logbook on a couple of occasions, but when I checked up on the series last Friday, the stamp was gone. But the worm keep on ticking.... The box celebrated its tenth anniversary last month, and still had the original stamp and original logbook in the box. The original logbook really surprises me. About a hundred people have logged in, and it's still the original logbook! Stamps can survive water damage, but logbooks generally do poorly. Invariably, ZipLocks always fail. It's not a matter of if--it's a matter of when. And this box is no exception--the ZipLocks have failed multiple times over the years, and I've replaced them, yet the logbook has always stayed dry. Or at least never more than a slight dampness about it, like dew on the grass in the morning. And you want to know the secret of longevity for this letterbox? A boardwalk. I hid the letterbox under a boardwalk. I didn't realize it at the time, but it was the perfect hiding place. The boardwalk had about two inches of space under it--not enough for people or kids to play under and find the letterbox. The boardwalk had boards pressed right up against each other--no large gaps that rain would fall through. Oh, water could (and does) dribble through the slots between the boards, but most of the water sheds off the sides. The hiding place essentially is a roof for the letterbox to protect it from the elements, and that's why the logbook has survived for so long. I also included a logbook with a lot of pages--the tiny logbooks common today were a rarity back then. People had more space to write messages (and did so! ), so the logbook never filled up despite the hundred or so people who have found it. That's an important lesson to remember. When you're out looking for a place to hide your letterbox, look for a location where it won't be found by accident, and look for a location that has a natural "roof" to shed rain. I've used fancy, seal-tight containers, but they can fail. Some are better than others, but even the mighty Lock-n-Lock can fail. ZipLocks will also fail. And when they both fail, your logbook is toast. The best, idiot-proof way to keep those logbooks intact for years and years is a hiding place where water just won't drip on it in a rain storm. These kind of locations aren't easy to find, and in many places, it may be absolutely impossible. But look for them. Holes in a tree (as long as the hole doesn't open skyward), under large rocks that can shed rain water, and under man-made structures like boardwalks that can shed water to the sides. These are the kind of places where a logbook can survive for a decade or more, even when the container and the ZipLocks fail. I've thought about replacing this logbook for years. Not because it was almost full, but because it had so many finders, so many stamps, and so many wonderful messages written in it. If it was ever lost or damaged, I'd be heartbroken. Most logbooks I've planted I don't have any sentimental attachment too, but this one is special. It was while visiting this logbook with Jess and Wes (AQ members #2) that I felt my first (and thus far, only) earthquake in California. I was sitting on the boardwalk when I felt it shake a little, and at first I thought one of them was shaking it. They thought I was, which was when I realized it was actually a small earthquake and had the pleasure to tell them they felt their first earthquake ever. =) And how lucky were they? I grew up my whole life in California and never felt an earthquake. They visit the state for two days and get to experience one! It was just a small quake, though. Later we learned it was 5-point-something. Enough to feel it, but not really enough to do any damage. But I wanted to see if I could keep it out there for a full 10 years. And finally, it's been 10 years. A decade. I've switched out the logbook with a new one. The original stamp is still there to found. When I checked up on the boxes last Friday, one box was missing completely. The box I call the pothead box was still there, but the logbook was soaked through and the stamp missing, so I've removed it for now. The worm was still alive and well, but I replaced the logbook just to preserve this one forever. And the last box was severely water damaged, so I replaced that logbook as well. If only I could afford a trip to California. It would be neat to find such a 'historical' box. Great post and interesting food for thought. 5/12.....My birthday. Nice to know how you spent "my" day. very cool story, Ryan. I hope we can find that box someday...but I have to say that boardwalks aren't always high and dry! We have one box on a boardwalk. Over the years that board walk has begun to get waterlogged....and right now you have to wade through knee deep water while you are walking on the boardwalk to get to the box, which has periodically been soaked, but is still there and still found on a regular basis. Wow, it seems like only yesterday we were romping around SLO at that first gathering 8 years ago...wish I'da known #1 was in that neck of the woods. Kinda neatthat I am the planter of #173076! I found your worm 'box and all the rest of Los Osos Oaks 8 years ago this week. I was so proud of myself, even though I'd forgotten to bring any stamp pads and had to huff and puff with all my might. I still think this is one of the most amazing venues of all the 'boxes we've gotten. What a great story about the possible longevity of letterboxes. Here in Texas we are still reeling from the fires that have swept thru the Piney woods of Bastrop County, near Austin. One historic letterbox series is almost certainly gone now after 10 years in the woods and another one, Lost Pines, planted on Nov 4th of 2000 just missed the edge the fire by a mile or so.